We learn how to be better community members by watching children at play. When someone needs a hand, kids pitch in together. 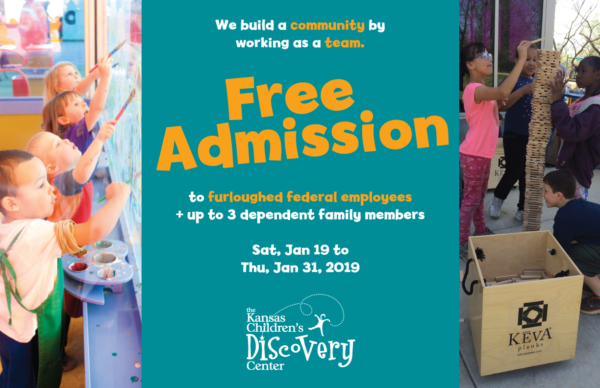 In recognition of the hardship caused to local families due to the current federal government shutdown, The Kansas Children's Discovery Center will offer free admission to furloughed federal employees and up to three dependent family members from Saturday, January 19 to Thursday, January 31, 2019 (including during our special hours, 9-5 on Monday, January 21 for Martin Luther King Jr. Day). An employee ID, badge or recent pay stub is required for admission. Please help us share this information with affected federal employees.